All transactions are safe and secure with a reliable history in online purchasing behind each of our associates. Buy the Bat and Robin t-shirt to own Batman clothing and merchandise. "Why so serious?" 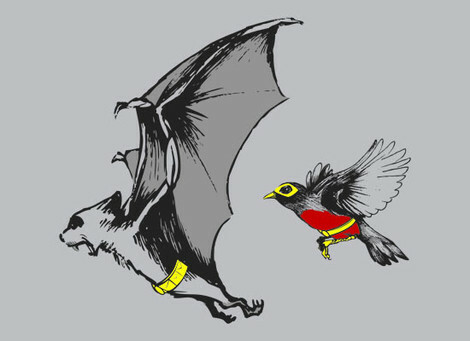 You don't have to be in this humorous Bat and Robin design. This unique piece of Dark Knight Batman clothing is perfect to wear as you watch the Joker get taken down in The Dark Knight movie. In the film, Heath Ledger portrays Batman's most notorious villain. He would definitely smile if he saw this design. Pair it with a Batman Dark Knight Joker t-shirt for the perfect gift. In addition to the Bat and Robin tee above, browse the Batman Clothing Gallery for more apparel like men's and women's clothes, kids shirts or hoodies.